A huge portion of our time is devoted to our jobs, so it makes sense that our workplaces and job descriptions would have a large impact on our health. But while some occupations have obvious dangers, others pose risks that are a little more subtle. Business Insider recently sifted through data from the Occupational Information Network (O*NET) to come up with a ranking of the 27 jobs in America that are most damaging to your health. Topping the list is a job that doesn’t involve handling nuclear material or working on an oil rig, but rather taking care of people’s teeth. 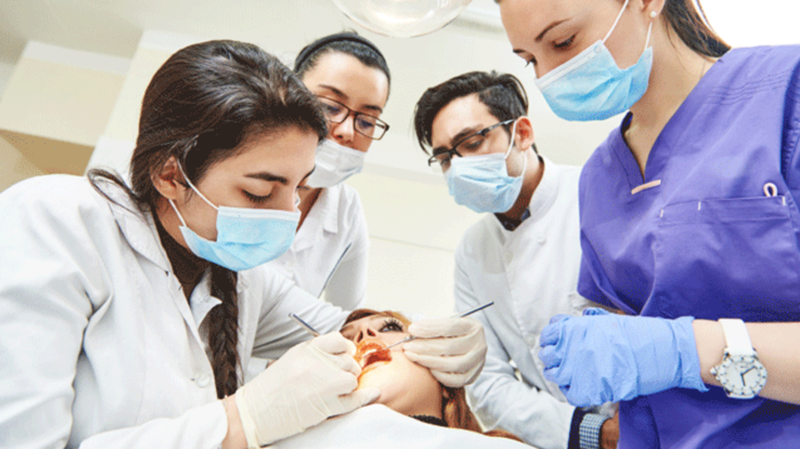 Dentists, dental surgeons, and dental assistants won the title of riskiest occupation in the country with an overall unhealthiness score of 65.4 out of 100. Behind them were flight attendants, who reportedly face more health risks than their pilot and flight engineer colleagues (tied for twelfth on the list). Rounding out the five least healthy jobs were all representatives from the medical field: anesthesiologists, veterinarians, and podiatrists. To weigh the danger levels of the 974 jobs they looked at, Business Insider used the six indicators of health risk set forth by O*NET. These include straightforward risks like exposure to infection, radiation, and hazardous working conditions, but they also single out factors like the risk of cuts, burns, and stings and the amount of time spent sitting. This means that while typically “dangerous” occupations like paramedics and elevator repairers made the cut, the list also includes entries—like trash collector and immigration inspector—that one might not necessarily label as risky. To see the full list, you can read the original article on Business Insider.